B Good's West-Side Burger & kale smoothie. Amidst the hungry lunch rush, Todd Brooks taps and swipes through his restaurant’s app, laying bare his efforts to bring the local community to his table. 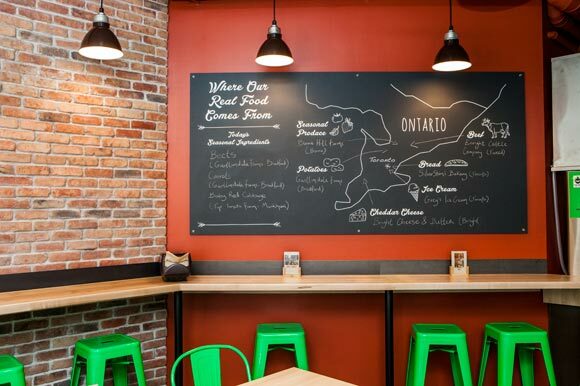 In February, at Jarvis and Front Streets, Brooks opened b.good restaurant's first Canadian franchise. A Boston-based fast food company with 18 stateside franchises, b.good makes healthy meals in-house and sources their ingredients from local producers. 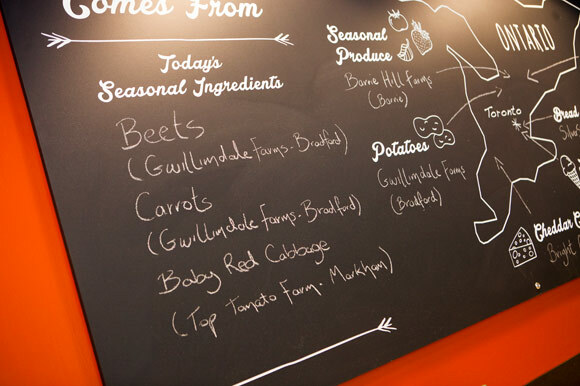 b.good aims to grow a loyal customer base and encourage healthy eating. The restaurant also works with charitable partners to give back and advocate for healthier diets in neighbouring communities. The app serves to accomplish both goals, helping customers connect to the brand, and serving as a conduit for charitable donations to the restaurant's partner, the nearby Regent Park Community Food Centre. 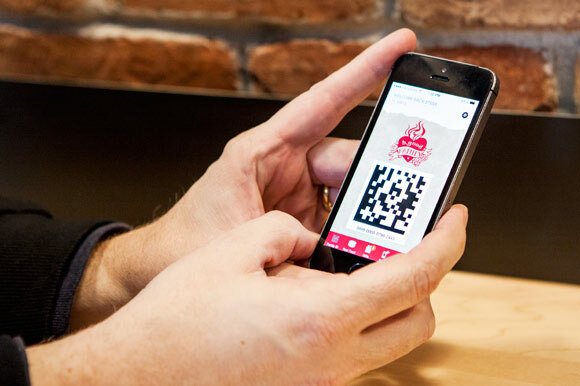 Loyal customers, who then scan a designated QR code using the restaurant's app, can accumulate food rewards—essentially, points that can add up to free food items--with each purchase. These customers then have the option of redeeming the rewards for themselves, supplying them to a friend, or donating the rewards to Regent Park. B Good&apos;s app displays a QR code for earning points to put towards food, gifts or donations. Regent Park can then redeem the aggregated rewards, which will spur b.good to cook in Regent's kitchen to cook for the community or out of b.good's food truck. The food centre can redeem the rewards at any time. For Brooks, technology is important for helping to connect with customers, and tell them more their partnership with Regent Park. “If [the customer experience] starts to feel impersonal, we’re not delivering real experiences for the customer when they come to the store,” said Brooks, a former financial analyst and capital investor with two decades of experience strategizing for consumer markets. Their partnership with Regent Park is their first Canadian charitable partnership. With plans to open b.good restaurants on Queen West and Yorkville, b.good plans on creating other charitable partnerships with each store. The food centre provides 50,000 meals annually for poorer residents and build local partnerships that address issues of hunger, poor health and social isolation. For Emily Martyn, the Regent Park Community Food Centre’s manager, the partnership fills a substantial gap for Regent Park’s resources, supplying better quality food for residents. Portraits of local Ontario farmers grace the walls of the new Front St location. In the restaurant, b.good shows tremendous respect. 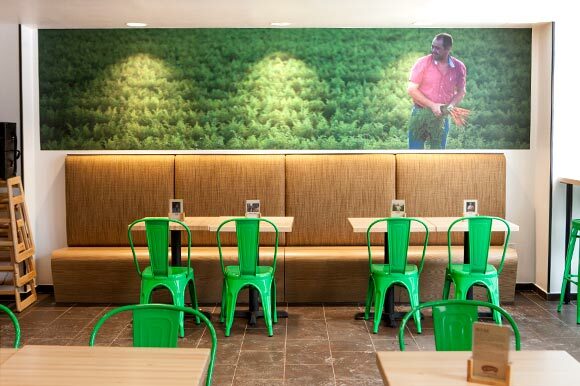 Large portraits and landscapes of farmers and farms adorn the restaurant walls. Small placards describe their lives and their products on cards at the tables. A spacious area with busy lineups, the farmers’ portraits are just as colourful as the foods on the menu. From quinoa and vegetable bowls to burgers and fries, the textures and flavours pop with with colourful sauces. With everything made in-house, the food tastes delicious. 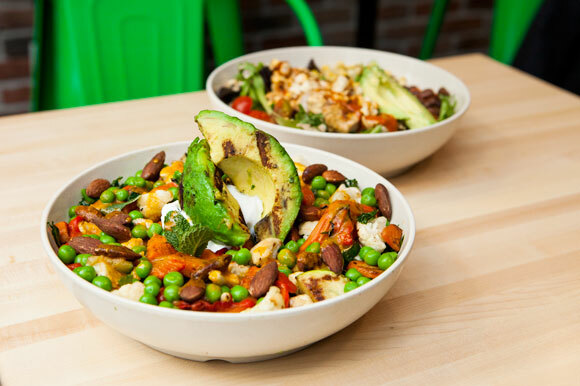 Curry & Grilled Avocado Bowl & Southwestern Chicken salad.Since being founded in 2004 by Anthony Ackil and Jon Olinto, the company has made working with local producers as essential to their business model. Breaking into Ontario has meant cultivating all new partnerships, and, for more than a year, Brooks and his b.good team have been appealing to family-owned and local brands alike to build a community-oriented brand. Food source map shows where feature ingredients are being sourced in Southern Ontario. “We didn't pretend that we knew who the best suppliers were, we came up and talked to people,” said Brooks, who joined b.good in 2009.
b.good now obtains meats from Enright Cattle Company, dairy products from Bright Cheese and Butter, and produce from Bradford, Ontario’s Gwillimdale Farms. Brooks sat down with the likes of Nick Saul, executive director at Community Food Centres Canada, and Ontario cheesemaker Ruth Klahsen to build contacts and find ideal producers. Saul, who speaks regularly about the community food centre model of food access and health, is impressed with b.good's efforts to “democratize” good food and highlight local producers. “It speaks to a growing population of people who are concerned about how their food moves from field to table and what they're eating,” said Saul, who believes b.good can succeed in Toronto. Farms from Bradford, Barrie and Markham show up on the food map on our visit. Saul has done his homework on the franchise, and working with them can be good for the future, he says. “The focus is always on healthy food and we pick and choose the companies we work with very carefully, because they’re not all built equally,” he said. With everything under way, b.good's charitable partnerships has room to evolve. Regent Park would love to see possible benefits to volunteers seeking food handler’s training, for example. “We were talking to [Brooks] about whether that was an option, getting youth or other people in the community who have barriers to employment, training them up in our kitchen and then giving them an opportunity to get some actual paid work,” said Martyn. Saul sees the franchise partnering with STOP community food centre, a local food hub in the Lansdowne-Davenport area, if b.good opens a restaurant in the area. B Good debuts on Front St East. For b.good, they're taking it one step at a time. “Our success is getting the people into the restaurant for the time, serving them in a way that makes them feel really welcome,” Brooks said. Perry King is a writer and journalist based in Toronto. He has work published in the Toronto Star, NOW Magazine and the BBC. You can find Perry on Twitter @kingperry.